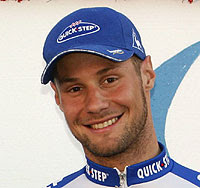 Tom Boonen won the stage today. And I am very excited. I don't have any idea why I am such a big fan of Big Tom. Maybe I need to see a doctor about this. All I know is that I am happy.